M3rNi3: Tihani is 5 Today! Today is Tihani's birthday. We were supposed to bring her to East Coast to cycle but it rained almost the whole day. So in the evening when the rained stopped, DH brought the kids down to cycle. While they were downstairs, they shouted for me, and then I ran to the windows and saw Tihani on her bicycle with her sis, Auni riding pillion. I took hold of my camera and snapped pix of them. 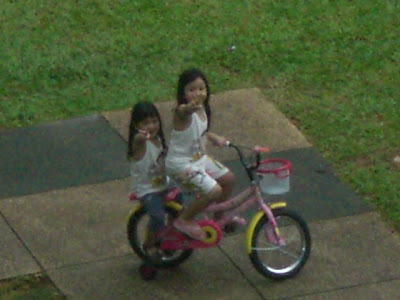 The girls on the bicyle showing me the Peace sign ..
And this is especially for you ..
Tihani, wishing you a Happy 5th Birthday .. promise Mama you'll be a good girl k.